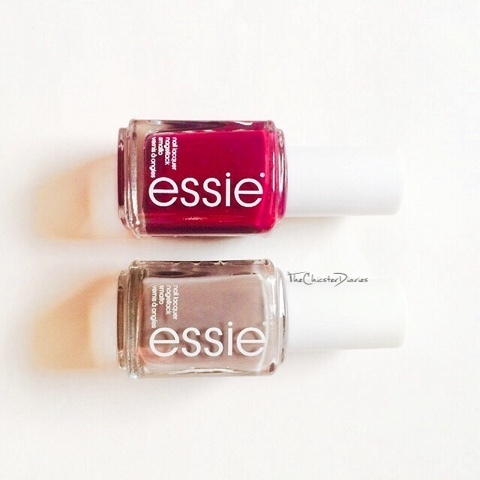 Claims: Choose our two favourite essie shades this fall, so chic it's almost criminal. Chinchilly: jet set cool. a sleek granite gray polish that positively radiates urban chic and subtle sophistication. this luxe of lacquers goes with everything. Results: The Essie Favourites to Fall For duo set comprises of two stunning fall/winter shades named Chinchilly and Bahama Mama. Chinchilly is a gorgeous cool toned grey shade. Though this looks like a normal gray shade in the pictures but somehow this is the first gray shade that I am really fond of. While as Bahama Mama is a rich and creamy deep berry shade. 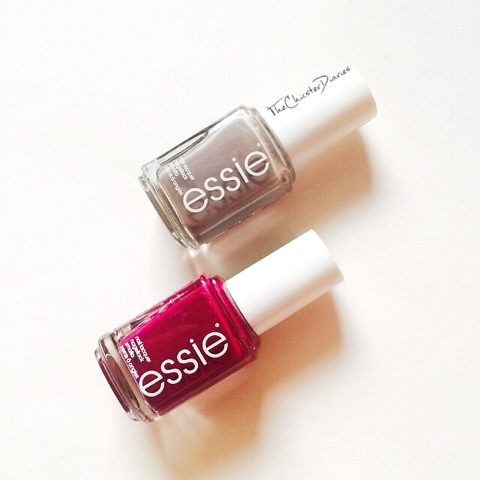 The nail enamels have the classic Essie bottle packaging as you can see in the pictures above. The brush is pretty good and doesn't leave strokes behind, it is a bit thinner than the other drugstore nail enamels in the market. The Chinchilly shade is bit sheer on the first application but after two coats it looks absolutely opaque. On the other hand the Bahama Mama shade is opaque in one coat itself. To increase the durability I always apply a base coat due to which it easily lasts for 4-5days. The fading is minimum and there is minimal chipping off after 4 days. Overall Verdict: If you haven't tried Essie nail enamels as of yet you really ought to try them! The color options and the staying power both are lovely. I will most certainly recommend you to try these. Hope you liked this post. Do let me know which is your favorite fall nail color or which one you are wearing at the moment in the comments section below. They were from the fall collection making them even more perfect! Grey one is beautiful n apt for fall collection.Is it matte?? No hun its not matte but it still looks gorgeous! Love both the shades <3 I would love to try them!! I think the combination of both these shades would look really nice. I love both shades a lot. I need to try out more polishes from Essie. 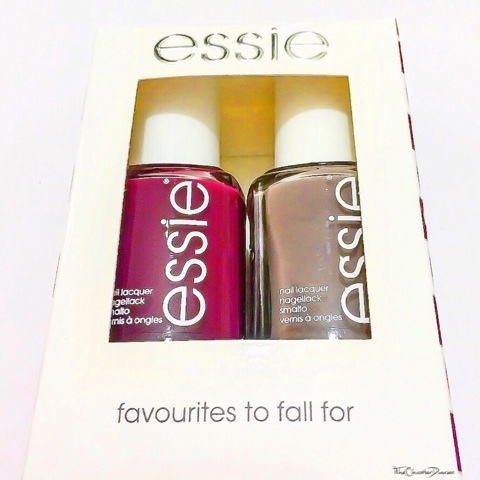 Love these shades, I will definitely use more Essie polishes! They have some really amazing shades.. Do try them! Awesome shades. I am currently wearing a sort of wine shade for fall season.. In that case we have something in common! I love the red color. Looks so festive and on time. Thanks.. They both are really good! It surely is a pretty color! cute shades. n the brand is one of the best for nail colors. Pretty shades, I especially want to try chinchilly. Chinchilly is a unique shade. You will surely love it! True that! The have such brilliant shades that I usually get confused which ones better! Pretty colours, I m yet to try Essie!! Thanks Erica that's very kind of you! These r perfect for fall! Look great on u! Do try them as I am sure you will love them too! Oh yes its surely a stunner! I know right! Even though its a fall color but I wouldn't mind wearing it all year round! Hello! I'm new here and I'm happy to meet you! Bahama Mama has been. Fave if many here.. It's surely a winner! I own the Second one. They give you the perfect natural daily nails. So true! Its perfect for every occasion. I have always wanted to try Essie.. I still don't know why I haven't given them a try.. I need to get my wish list out. They are too good! You need it a try. That's strange! I haven't faced any such issues with the ones I have, do check out some other shades for sure..
Thankyou Krithi.. It certainly is my fave plum shade too! These are absolutely gorgeous shades!